The meet and greet of Aboriginal people this morning, in town for a two-day national convention on sovereignty, was star-studded and animated. 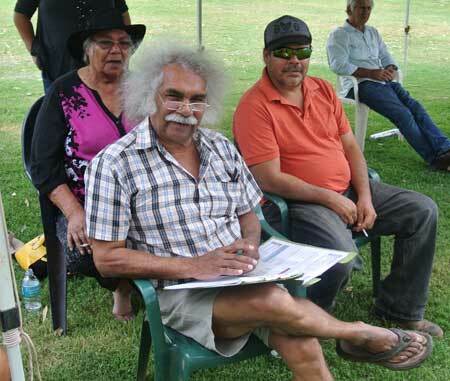 Controversial former ATSIC chair Geoff Clark was there (at right), and so were Tasmanian activist, lawyer Michael Mansell (at left) and locals Maurie Ryan, former Central Land Council chairman, Rosalie Kunoth Monks and activist Lesley Tickner (all below left). This is how Member for Namatjira, Alison Anderson (PUP ), saw the purpose of the gathering under the Telegraph Station gumtrees: “The federal and state governments are attacking landrights and our land councils. “They think they can get the oil and the gas out of our country for free. They create the perception that the land Aboriginal people live on is all empty, just so they can can steal our oil and gas. Under landrights Aborigines can withhold consent for mining. All they need to do is say “no”. Ms Anderson: “Yes, and we’ll be starting to do that, absolutely. Adam Giles is adamant that he is going to develop the north on land 50% owned by Aboriginal people. 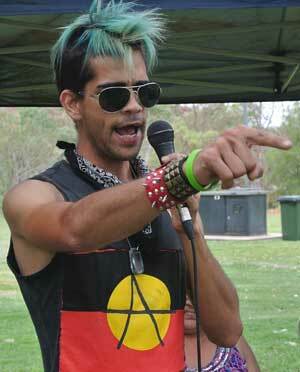 “He doesn’t like to talk to Aboriginal people but we’re going to say, you are going to come and talk to us blackfellas. We’re the owners of this country and if you want to develop the north you are going to start talking to us. Arthur, with views like that, you’re most welcome in Far North Queensland … God’s own country! Wow, so over 60 people turned up to this event. Sorry but these people are not my leaders and they do not speak for me. This is about more than Money! This Is The WAR ON TERRIOSM . They Are Attacking our water supply. Pumping Hundreds of galons of toxic chemicals into our ground water.So it’s no good for anything ,Forget about the money YOU CAN’T drink it! Arsenic ,lead ,Methanol, Formaldehyde Just to name a few left in the ground, 1000s of litres. We Need to stop this War ON Our Inland Waters . So our kids have a future and our grand children. Because We are putting the Future at risk. So WE All Need To Work Together to stop Fracking. And Us, Australian People, We Need Strong Representatives because Our Dreamtime is under threat.. So Let’s Ask Adam ? This is a very deceptive photo, there was over 60 people there for most of the summit. This picture must have been taken while people were still arriving. We agree whole heartedly with Arthur Bell. He has hit the nail on the head. These self elected dictators should go away and let people to speak up for themselves and take control of their own destiny. Not have it driven and shaped by people who have failed their own people by trying to be the spokesperson for people oblivious to what “They” are up to – for personal gain no one else’s. Looks like plenty of empty seats which is not really surprising. Anyway … I can only ask why Alison did not revoke the oil and gas exploration permit application over Watarrka NP when she was directly asked to by traditional owners, while she was a minister who had the ability to do so. What a sad weathervaney political joke you are. We have the Sovereignty Mob. Then the Recognise Mob. The Treaty Mob. With the Aboriginal Provisional Government. And the National Congress. Some very determined, articulate and well paid Blackfellas. Some very seasoned campaigners. As Stephen Hagan would say, “the usual suspects”. And most ideologically opposed. With views and agendas incompatible. And some might say, “with heads buried in the sand”. “They” want to be in charge. “They” want to run the show. And all the rest of us Blackfellas have to follow “their” solutions and agendas. Apparently. Evidently. Whether we want to or not. Whether we “agree” to or not. Whether we “like” it or not. All on their own trip. Many are a law unto themselves. Many of these prominent long time long term Aboriginal activists, agitators and media and self-appointed so-called leaders, they have to take a lot of responsibility for where we are today. A lot of what’s happening today developed on their watch. And it can be argued that they have failed us. With trillions of dollars generated in the name of and in the cause of, the advancement and the betterment of the Aboriginal and Islander People of Australia. A failed exercise in economic independence and self determination. With many wasted opportunities. Not to forget the money. WASTED. SQUANDERED. Aboriginal Rights?